Foundation Repair Contractors Tampa, FL. The Foundation Repair Network will connect you with the Best Foundation Repair Contractors in Tampa, Florida. The TOP TWO Foundation Repair Contractors in Tampa, FL. and the State of Florida are Foundation Masters, LLC and Champion Foundation Repair! These two companies have the best reputation in the State of Florida. They also have the most recognized Foundation Repair Warranties in the State of Florida. There are many factors that will cause Foundation Problems in Tampa, both natural and man-made. Lets go over three of the most common Foundation problems that create Foundation Repairs in Tampa Florida. If a Foundation Repair Contractor is Certified by The Foundation Repair Network than we guaranty they fully understand all the conditions mentioned below that cause foundation and structural failures. The conditions that we build our homes & business in can cause every homeowner and business owner face a foundation and structural problem during the life of that structure. Below are the conditions that cause Foundation Damage. Soil conditions, soil erosion, hill creep, aquifer, clay soils, sinkholes, clay heaving, foundation heaving, organic layers below subsurface, soil moisture evaporation, saturated soil, allowing soils to expand and contract witch will greatly impact the load bearing capabilities of the supporting soils and also allow vertical movement in both directions (up and down). Poor construction, building on uncompacted soils, poor engineering, failed inspections or over looked, poor building martials. Weather condition, heavy rain, storms, drought, season changes wet-dry, weather conditions will greatly impact soil conditions. The Foundation Repair Network wants to help homeowners choose the right Foundation Repair Contractor in Tampa, FL. and Florida. When a Foundation problem arises, this can be a very stressful time, and on top of that it seams like every Foundation Repair Company has a different type of repair. Also remember, when its time to sell your home, the first thing the potential byer does is look at the company that you used to make the Foundation Repairs. Foundation Repair Contractors in Tampa, FL. When a Homeowner or Business owner is faced with a costly Foundation Repair , it can and usually is a very stressful time in there life. 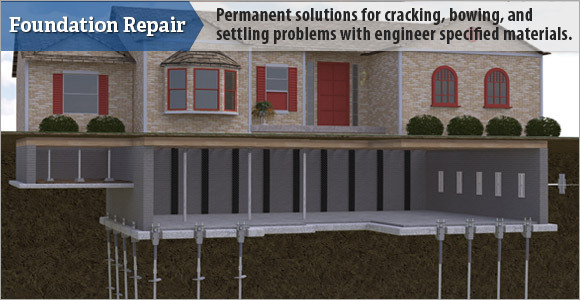 The best way to approach a costly Foundation Repair Project is to consult a engineer that is experienced in Foundation Repair methods. The number 1 rule is to get three bids and try to treat this Foundation Repair Problem as a business deal. If you have your hart in it (because its your home) that can cause you to make a bad dissension, and never be price driven. If you get (3) bids general rule of thumb is go with the middle bid, BUT if the best company is only a couple hundred dollars more , than that's a no brainier. When you try to sell this home, this Foundation Repair will be an issue so go with the best company. The two best companies are #1 Foundation Masters, LLC and Champion Foundation Repair. Click the links below for the best Foundation Repair Contractors in Tampa. If you need to look up a permit click on the links below.